If you have a tooth that is causing you pain through infection or decay and would like more information about root canal please fill out our enquiry form. Do you have a lingering sensitivity when you eat anything too hot or cold? Does it hurt when you chew, or do you constantly get dull or severe aches and pains in your teeth? If so, it’s possible you may need endodontic therapy – also known as root canal treatment. "Endodontics" comes from the Greek words "endo" – meaning inside – and "odont" – meaning tooth. Endodontists focus on diagnosing and treating problems that occur inside the tooth, mainly the nerve inside the root canal. Sensitivity that won’t go away and pain in the teeth may be signs of a pulp inflammation or infection – also known as pulpitis – which can leave you feeling extremely uncomfortable. And, if it’s left alone, this could result in an abscess. Even if you’re not experiencing any pain, your dentist may have picked up something in an examination or x-ray and referred you to an endodontist. Not all teeth in need of root canal treatment will cause pain however the damage inside will unfortunately only get worse. Endodontists are highly skilled dentists that have undergone years of advanced training in the diagnosis and treatment of problems inside the tooth. At Dental Perfection in Hampstead, our specialist endodontist is Dr Shahrzad Rahbaran. Often referred to as ‘the savers of teeth’, these dentists do everything they can to avoid the need for extraction. In the majority of cases, root canal treatment can remove the infection, protect your tooth, and restore it to its optimum condition and function. Your tooth is made up of two parts; the crown - which is the white part of the tooth above the gum level that you can see in your mouth - and the root. The root keeps your tooth in place reaching all the way down to your jaw bone like an anchor. Just like the roots of a plant, your root canals (where the pulp is) branch out inside each of your teeth; running like a tunnel from the crown of your tooth to the end of each root. Each tooth can contain any number of root canals, all filled with dental pulp. Pulp is one of the most vital parts of the tooth. Made up of living connective tissue, blood vessels and large nerves, the pulp branches out and fills the root canals. It’s responsible for sensory functions, forming dentin and enamel during tooth development and keeping the tooth moisturised and nourished. When would you need root canal treatment? When the outer enamel or cementum is damaged or eroded by decay, bacteria are able to make their way through to the dentine causing your dental pulp to become inflamed and/or infected. Infections can be caused when the bacteria that live in your mouth find their way into your teeth. This can be through tooth decay, gum disease, broken crowns, loose or leaky fillings, or if your teeth have been cracked or damaged due to trauma. Antibiotics are unable to treat infections in this area. Leaving an infected tooth in your mouth will not only make things worse, it could damage your tooth beyond repair. So, the patient would have only two options: to have root canal treatment, or to have the tooth removed entirely. You can read more about the benefits of root canal too. At Dental Perfection’s North London clinic in Hampstead, we never recommend extracting a tooth that can be saved. Root canal treatment removes the infection and reseals the tooth so you can keep your natural teeth for as long as possible. The root canal procedure is performed by a skilled endodontist, as root canal treatment is technique sensitive and numerous research has shown that specialist endodontists have a far higher success rate than those who are not a specialist in this field. During your root canal treatment, they will carefully remove the infected pulp, clean, disinfect and gently shape the root canal, then fill the empty space to prevent future infection. 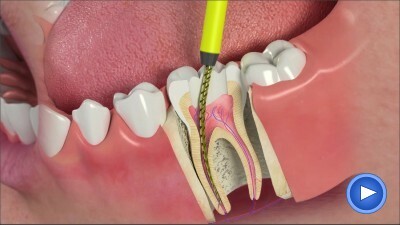 How a root canal procedure works? We understand that a lot of patients get nervous about dental procedures. However, a root canal treatment at Dental Perfection, based in Hampstead, really does relieve the pain you’re suffering and save your teeth. Find out more about the costs of root canal or frequently asked questions regarding root canal treatment. We even let you know of any potential risks of root canal treatment too. To book your root canal consultation with our highly qualified specialist endodontist, Dr Shahrzad Rahbaran, please call us on 020 7431 2710, or come see us at our surgery in Hampstead, North London to make your dentist appointment.